It is known that at least 100 people died after a ferry carrying hundreds of people capsized in Lake Victoria, Tanzania, authorities said. There are many more missing and it is feared that more than 200 people have drowned. Rescue efforts resumed Friday after being detained overnight. 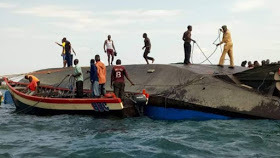 The MV Nyerere ferry capsized near the island of Ukara on its way from Bugorora. It is believed that the overloaded vessel capsized when crowds on board moved aside when it docked. It has been said that the official capacity of the ferry was 100 people, but officials say the boat was carrying more than 400 passengers when it capsized.